Hi, everyone! I’m Melanie Gable and I’m guest writing for The Healthy Mouse to share my review of The Walt Disney Studio’s latest film, “A Wrinkle in Time.” Many thanks to Jessica McDonald for inviting me to attend the press screening in her place! On February 24th my husband and I were guests at what turned out to be only the second public showing of “A Wrinkle in Time,” with producer Jim Whitaker and director Ava DuVernay providing enthusiastic introductions before the film. Often called an “unfilmable” novel by both fans and critics of the tome, Madeleine L’Engle’s “A Wrinkle in Time” was turned down by at least 26 publishers before being published in 1962. The sci-fi/fantasy novel became an instant classic and went on to win the 1963 Newbery Medal, a prestigious annual award given to American authors of children’s literature. (L’Engle’s brilliant and beautiful acceptance speech is also worth a read.) Following the interplanetary quest of Meg Murry, a tween girl suffering from deep insecurity and the unexpected and mysterious absence of her physicist father, “Wrinkle” takes readers outside of their own galaxy and into mysterious worlds that echo our own in some ways and completely deviate into pure imagination in others. Though it was written in the 60s, “Wrinkle” continues to enthrall new generations of kids, even today. As a child I constantly saw my peers, especially young girls, reading this book, and I’m surprised I never picked it up. Maybe I was put off by the trippy cover art that was typical of the versions published during my childhood, but I should have remembered to literally never judge a book by its cover, because I know I would have enjoyed it, especially given that it was a science fantasy adventure with an awkward female protagonist. Reading the novel as an adult to prepare for this review, I was thoroughly entertained and, though the book is far from perfect, it has great heart, inventiveness and beauty, with a timeless message that still resonates today. I also understood why the novel might be so difficult to turn into a film. “Wrinkle” skips from event to event and planet to planet in a rather disjointed way (as seems to be the nature of “tessering,” a time and space travel shortcut in the book), building fantastical worlds and tackling a huge number of issues at once, including non-conformity, faith, hope, self-actualization, familial bonds, love, and good vs. evil. Given the Herculean task of adapting the book was screenwriter Jennifer Lee (“Frozen,” “Wreck-It Ralph”), no stranger to writing epic children’s adventures and strong female characters. Lee’s script is faithful to L’Engle’s themes while breathing modern life and freshness into the story. Tackling the even bigger challenge of helming the production was Ava DuVernay, director of Oscar-nominated films “Selma” and “13.” By typical Hollywood standards DuVernay was an unconventional choice to direct, and history-making as well, as she became the first black female director ever to helm a movie with a $100 million budget. But DuVernay’s empathy, vision and artistry make the choice, in retrospect, almost obvious, as her deep connections to the actors, characters and story shine through in nearly every scene. “Wrinkle” feels personal in a way that I would credit largely to DuVernay, who cast a diverse group of actors to tell the intergalactic story, which is grounded in the sun-baked setting of contemporary South Central Los Angeles before taking off into new worlds. Storm Reid is Meg Murry in Disney’s A WRINKLE IN TIME. Storm Reid gives a breakthrough performance as Meg Murry, the heartbreakingly insecure heroine of the film, who not only has to endure the 4-year anniversary of the disappearance of her father (Chris Pine), but also bullying from mean girl Veronica (Rowan Blanchard), who works through her own insecurities by targeting Meg. As she trudges through her life with eyes downcast and a huge, protective chip on her shoulder, she mirrors the pain felt by so many teenagers who don’t fit in, who hate themselves for their inability to blend into the crowd, and who lash out at the adults who don’t seem to understand them. Meg’s mother, Kate, also a physicist of renown, is played with empathy and nuance by Gugu Mbatha-Raw. Kate tries to connect with Meg, but she’s working through lingering anguish of her own at the sudden disappearance of her husband and can’t quite reach through Meg’s defense mechanisms to help her cope. The only person who seems to “get” Meg is her adopted brother Charles Wallace (Deric McCabe), a charmingly precocious 5-year-old boy with surprising verbal dexterity and disarming insight into the feelings of those he loves. As Meg and Charles Wallace walk their dog around the neighborhood, they run into Calvin (played with sweetness and quiet conviction by Levi Miller), a star athlete and student slightly older than Meg who tells them he felt “compelled” to be in that spot at that time, and seems to be drawn to Meg in a way she doesn’t quite understand or believe to be sincere. 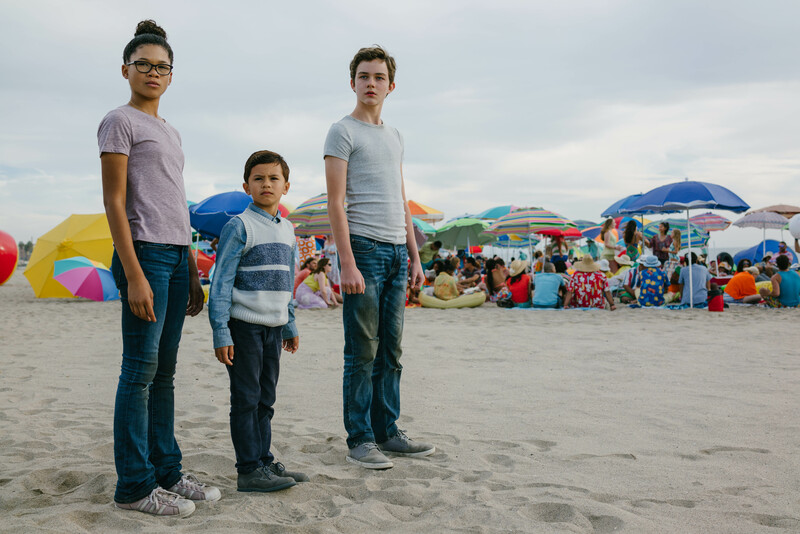 Storm Reid is Meg Murry, Deric McCabe is Charles Wallace Murry and Levi Miller is Calvin O’Keefe in Disney’s A WRINKLE IN TIME. Into their lives walks (or, rather, prances,) Mrs. Whatsit (Reese Witherspoon), a lovely, if eccentrically dressed woman who looks like she stepped out of a Björk video. Mrs. Whatsit soon reveals that she happens to be a celestial being on a mission to reunite Meg with her father, as are her traveling companions, Mrs. Who (Mindy Kaling) and Mrs. Which (Oprah Winfrey). Reminiscent of the three spirits in “A Christmas Carol,” each being provides guidance to the children in different ways. Mrs. Whatsit, a few billion years younger than the other two, infuses the proceedings with playful energy and blunt honesty, acting as a sort of tour guide through their interplanetary travels. Mrs. Who, speaking only in quotes from Earth’s greatest leaders, philosophers and artists, provides insight when the group is searching for answers. (Kudos to Lee for the updated and sometimes hilarious quotes, and to Kaling for her great timing and delivery.) Mrs. Which, played with motherly warmth and strength by Winfrey (practically a celestial being in her own right), is the leader of three – the one with the most experience, the sage who looms largest, quite literally, and has the most wisdom and light to give when things seem darkest. Oprah Winfrey is Mrs. Which, Reese Witherspoon is Mrs. Whatsit and Mindy Kaling is Mrs. Who in Disney’s A WRINKLE IN TIME. Quickly the children are “tessering” to other planets in other galaxies – the stunningly gorgeous Uriel, home planet of Whatsit, Who and Which, the remote and unnamed home of the Happy Medium (a funny and touching Zach Galifianakis), who gives Meg more insight into how to move forward in her quest, and Camazotz, the eerie and ever-changing planet that has completely succumbed to the evil known simply as “IT.” Here Meg finally finds out the truth about her father, and her trust in her family, love, and herself is pushed to its breaking point. The journey takes a deep physical and emotional toll on Meg, and she must use every bit of her knowledge and inner strength in her battle against her foe, and she must do it alone. The cast of the film is committed and excellent across the board, a clear reflection of DuVernay’s creative casting and direction. I greatly appreciated seeing a girl of color in the lead role (especially an actress as strong as Reid), and I’m certain there are young women all over the world who will watch this movie and be thrilled to see themselves represented in a complicated and admirable heroine. The visual effects, supervised by Industrial Light and Magic’s Rich McBride, were a bit hit and miss, but were most outstanding when mixed with practical sets and real locations. (The gorgeous hills of New Zealand combined with the otherworldly creatures and backdrops of the planet Uriel made for some of the most memorable and beautiful scenes in the movie.) Production designer Naomi Shohan brought great artistry to each unique setting and world in the film, creating a vivid backdrops that were compelling and interesting throughout. Paco Delgado’s costumes were delightful, especially those of the three Mrs. W.’s, and the creative makeup and hair styling enhanced the colorful otherworldliness of the film’s alien creatures. And the soundtrack was totally on point, adding to the fresh appeal of the movie with contemporary and unexpected artists like Sia, DJ Khaled, Demi Lovato, and Sade. “A Wrinkle in Time” was made for young audiences, but adults should find plenty to enjoy in the film, especially those who read the book and loved it during their own childhoods. The movie has its flaws, but it’s definitely worth a viewing, especially given how much heart and light it offers in dark times. And maybe that’s what we could use more of in our entertainment these days – a story that is sincerely, unabashedly hopeful. “A Wrinkle in Time” opens nationwide on March 9, 2018, you can find tickets here. Disney Junior Dance Party On Tour is a Must-See!